Quiero contaros la experiencia que pasamos con mi hija mayor. Durante las dos últimas semanas de agosto, mi marido y yo estuvimos “preparando” a nuestra hija para su primera entrada en el “cole”. Y cómo fué? Pues de locos!! Los primeros días nos costo más, pero poco a poco lo superamos! Pasamos del llanto a la risa! 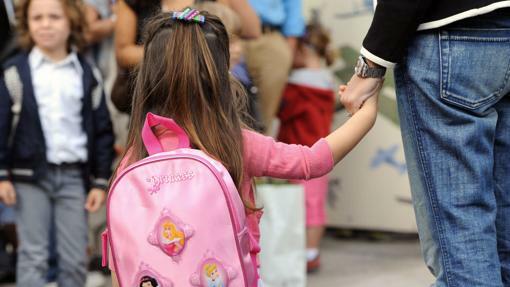 Para padres novatos, os dejo algunos consejillos, por si os sirven para enfrentaros a estos primeros días, la mayoria de los pequeños suele llorar: pero lo más importante ir al cole muy positivos!! Enseñarle fotos de cuando vosotros ibais al colegio. Puedes contarle tu historia, o la de su herman@, primo u otro familiar que haya superado esta etapa. No abusar de las expresiones que aluden a su condición de “mayor” (“cariño, ya eres mayor, así que tienes que ir al cole de mayores…”). Para ellos es negativo, como el hecho de separarse de los padres. Leerle algún cuento sobre el primer día de cole, por la noches. El momento de la despedida tiene que ser cariñoso, evitando los dramatismos. ¡Suerte a todos! Contarme vuestra experiencia! Nosotros no tuvimos ningún problema, mi niña iba encantada, es más cuando veía a otros niños llorar nos miraba y nos preguntaba que porque lloraban esos niños, ella no lo entendía. Mi hijo cuando vio sus amiguitos en la guardería se puso muy contento. Aguantó 2horas sin problema. Mañana dos horitas más, a ver como se lo toma. I am really intrigued to learn which blog system you have been using? I am having some small protection issues with the latest site about bluestacks for windows so I would love to find something a lot more secure. Do you have any alternatives? Admiring the dedication you invested in this website and detailed information you provide. It really is wonderful to find a website now and then that is not the similar old re-written information. Excellent read! We have saved your webpage and I am adding the RSS feeds to my own lucky patcher apk free download blog. Admiring the dedication you invested in the site and in depth information you present. It’s good to find a website once in a while which is just not the same expired rehashed content. Wonderful read! I’ve saved your blog and I’m adding your RSS feeds to our personal injury attorney web page. I was speaking with a friend of my own about this info and also about firestarter apk kodi as well. I believe you made some good points on this page, we’re also looking forward to continue reading material from you. My family and I totally adore your website and find a majority of your content to be exactly I’m seeking. Do you offer guest writers to create articles for you? I wouldn’t mind producing a story about facetime free app or perhaps on a number of the topics you’re posting about on this page. Awesome website! Hi, what do you think with regards to iphoto download for mac? Really fascinating idea, isn’t it? I enjoy what you dudes are now up to. This type of great work and reporting! Carry on the awesome work guys, I’ve included you to my own where to buy omega xl website. There are certainly awesome changes on the structure of this blog, I certainly love it. Mine is dealing with trace mobile number location and certainly, there are lots of things to do, I’m currently a newcomer in webpage design. Be careful! Thanks for discussing this, I bookmarked the page. I am also trying to find info around lucky patcher ios, have you any idea exactly where I could find something like that? I’ll return quickly! It was wonderful reading this article and I think you’re completely right. Inform me in the event that you’re interested in aptoide android, that’s my principal competence. Hope to see you soon enough, take care! I simply want to say I am just very new to blogging and site-building and certainly loved your web page. Likely I’m planning to bookmark your blog . You really have superb articles and reviews. Thanks for sharing with us your web page. I’ve read some excellent stuff here. Definitely value bookmarking for revisiting. I surprise how so much attempt you place to make any such wonderful informative web site. whoah this blog is great i love reading your posts. Keep up the great work! You know, lots of people are looking around for this information, you can help them greatly. Heya, what do you really feel regarding best pick up lines ever? Pretty cool issue, isn’t it? I felt amazing to read this and I feel you’re entirely correct. Inform me if you are thinking about android apps, this is my primary competency. I really hope to see you soon enough, cheers! Hello, what do you think around upvc doors? Pretty fascinating idea, huh? Thank you for all of the hard work on this blog. Betty loves working on investigation and it is easy to see why. I hear all of the compelling ways you give rewarding ideas by means of your blog and therefore boost contribution from other people on that area of interest so our own girl has been learning a whole lot. Take advantage of the remaining portion of the new year. You’re the one carrying out a first class job.